When asked what it would take for him to star as the Bachelor again, Nick jokingly admitted to Us Weekly, "Imprisonment? I don't know. A gun?" Nick competed for Andi Dorfman and Kaitlyn Bristowe on The Bachelorette's tenth and eleventh seasons, respectively. After finishing as the runner-up both times, he decided to appear on Season 3 of Bachelor in Paradise in 2016, which also ended with him going home single. 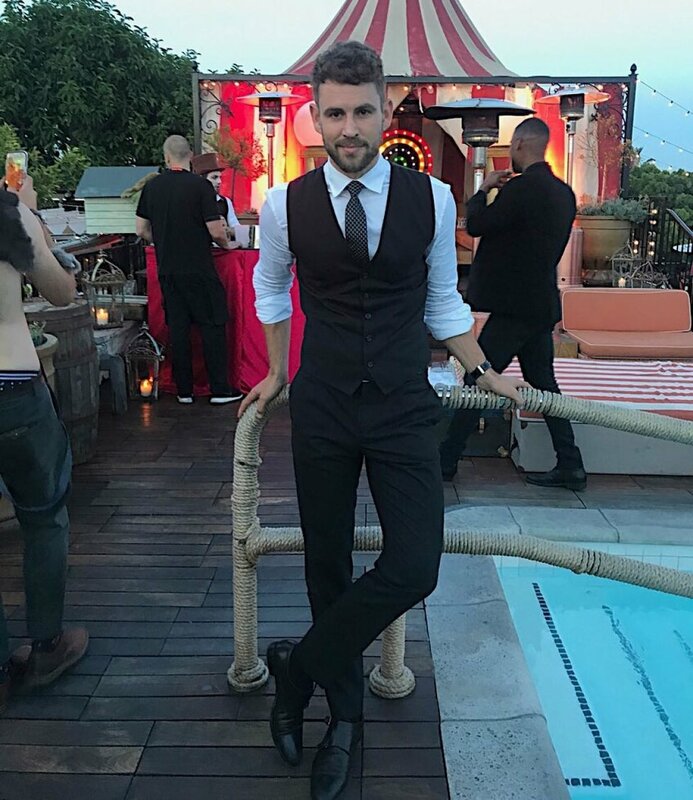 Due to Nick's charm and determined pursuit of a significant other, ABC signed him on for The Bachelor's 21st season in 2017. The season ended in March 2017 with Nick proposing marriage to Canadian special education teacher, Vanessa Grimaldi; however, the couple announced their split nearly five months later. Following their break up, Vanessa seemingly took a shot at Nick, an aspiring actor, on Dean Unglert's podcast by admitting she'd like to date a man who doesn't care about his Instagram likes or perception on social media. In fact, Vanessa said she'd prefer a guy without an Instagram account at all. "Things like whether someone's on social media or not, the reality is, whether you're someone who's a public figure or not, a lot of people have a pretty strong social media -- it's almost like the new norm," Nick told Us Weekly. "But sometimes it can be refreshing that someone is less involved in that." "I don't like to put any limits. Personally, I think limits like that are kinda silly... It's more about connection than that kind of stuff," he noted. ABC will likely announce its pick for The Bachelor's next star in the next couple of weeks. While Ben Higgins is rumored to be one of producers' options, Nick said, "I really don't [think he'd do it]. It would be a lot. I mean, you never know. Last time I checked, I don't think he would do it." Ben starred on Season 20 of The Bachelor in 2016 and got engaged to Lauren Bushnell. It appeared the pair had found their happily ever after, but they surprisingly split after a little over one year together, and the demise of their relationship was incredibly hard on Ben. Ben struggled to date again while Lauren quickly moved on with her current boyfriend whom she met on Tinder, Devin Antin. "I really have no idea who will be the next Bachelor, but I hope it's [Blake Horstmann]," the former software salesman told Us. Blake is also up for the Bachelor position, as he had his heart broken by Becca Kufrin at the end of The Bachelorette's fourteenth season. Blake finished as the devastated and blinsided runner-up behind winner Garrett Yrigoyen.